Come and admire the ballet of humpback whales in our Polynesian waters ! 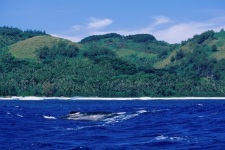 Rurutu is par excellence the island of whales because they come for 3 to 4 months to reproduce in our waters just a few hundred meters off the shores, and to wean their whale-calves born there. 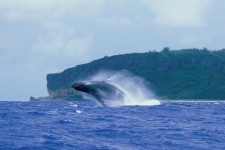 You may see humpback whales that are up to 16 meters long with immense fins. You can sometimes hear the love song of these majestic Cetacean. If you wish to observe them, you will have opportunity to do so from the platforms located in bay of Moerai between July 15th and October 15th. If you are brave enough, go diving with them in the company of a guide-instructor whose job is to respect the animal while taking care not to stress nor disturb it. When they sleep they do not move and your guide will enable you to slip discreetly into the water with flippers, masks and snorkel. You will then be able to witness a wonderful and unforgettable show. On the other hand, during the whales active phases you can observe them from a boat where you will be able to take as many photographs as you wish of the jumps and exquisite sights of these acrobats. 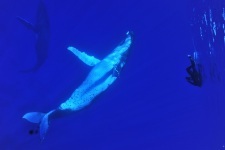 If you do not have time to go to Rurutu, between August 1st and October 31st you can, for example, organise a private excursion in Tahiti with a diving monitor to look for the humpback whales. Many providers will be delighted to guide you through this great adventure in Tahiti and Moorea.